It has been a couple weeks since I updated this blog. I guess I’m not the best at it, but hopefully in the future, and as time plods on, I will become a bit more diligent about this part of my website and life. Well that is more or less my story for the past 2 weeks. Between relatives visiting, going to visit other relatives, parenting, and other duties, things that you had planned to do get back-burnered. However, what they get replaced by can be awesome! When I was a child, my family and I would always take neat vacations. My father was a college professor, and my mother was a housewife. The university and the public schools always scheduled their breaks to coincide and so we were always able to go interesting places and for good amounts of time so that we really got to get our hands dirty with the places we would visit. My dad is a big history fan and so a lot of our trips would be to places that had a strong historic feature. This included a lot of national parks as well, and anytime a museum would be nearby, we would stop in and see it. Sure some of the places we went were on the boring side (one trip to the “Aquatarium” in St. Petersburg, Fl comes to mind.) But even on those boring trips, the fact that we were all there as a family enjoying our vacation is the memory that stays. My son seems to have this same enjoyment for this type of thing that I had at his age. 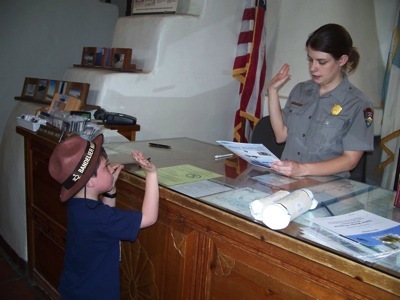 He is a Junior Ranger with the National Park Service and we take him to as many parks and monuments as we can where he does various activities where he learns about the parks and there history and taking care of our natural resources. For completing these activities, he earns patches and badges specific to each park or monument. It is a very cool program and leaves the Boy Scouts trailing far behind. Several of his friends (girls and boys) are into the program around here and there is a nationwide network of kids and other Junior Ranger activities available as well. There are 2 points to this blog. 1. Take an interest in the environment, your surroundings and the history they contain. 2. Teach your children to have that same interest and respect for our planet.